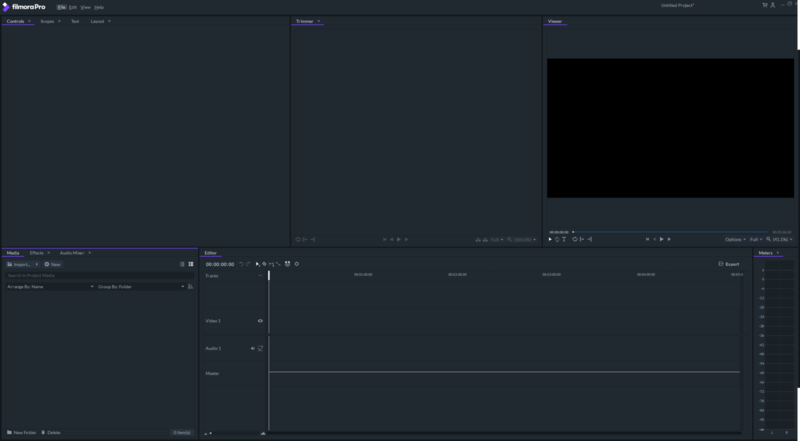 Any non-linear editing software has to be judged among its competitors, which include strong offerings from Adobe, Sony, and Blackmagic. 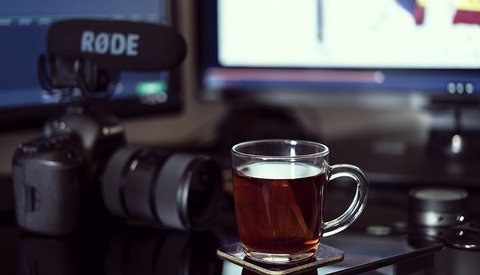 Each editor can be expected to perform the basics, including editing and arranging clips, basic audio editing, support for color correction, and a variety of export options. I’ve tested out video editor FilmoraPro, working with a variety of footage from sources, including DSLRs, action cameras, and an iPhone. Overall, I’m pretty impressed. The software doesn’t get in the way, and it was easy to pick up the interface. While the panels are highly customizable, I stuck with the editing default workspace, as it closely replicated what I’m used to. Other workspaces include audio, color grading, media playback, and effects editing, with each offering a new layout of panels. The workspace is clean and simple, sharing similar design elements to other editors. Starting with the basics, the software offers the full suite of timeline tools expected by any pro. Unlimited tracks, clip grouping, and range-marking make it possible to effectively organize even very complex timelines. Timeline performance is snappy while working with high-resolution footage when tested on a i7-4770K and Nvidia GTX 970 card running Windows 10. The standard workflow of media, trimming, viewing, and arranging is easily accommodated by the available tools. Audio editing is one of the strong suits, as the software offers a variety of professional style tools built directly into the editor. Syncing audio to clips is easy and intelligent, requiring only a few clicks. Compression and noise reduction work well and offer a variety of options for dialing in the correct level of adjustment. The software also provides many options for custom animations and effects. Keyframing and ease in/out are both simple to implement. Also, dozens of customizable visual effects, such as lens flares, chroma keying, blurs, distortions, and preset color grades are included. 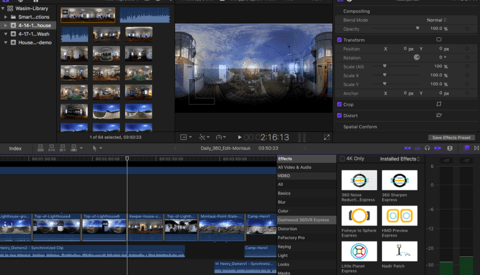 For editors new to color grading, there is support for look up tables, or LUTs, along with a number of built-in looks. This is a great hidden value, as it lets editors get started with color grading without any additional purchases necessary. If you prefer a more manual style of color correction, YUV color correction wheels are available, along with individualized tweaks to highlight, mids, and shadows. Scopes, wheels, and LUT support make color editing easy. There are a wide variety of tools built into FilmoraPro. For my uses, this software would perform every function I need and more. The tools are easy to understand, implemented in line with industry standards. The easy customizability of the software makes it easy to tweak anything that you want to change, while the default workspaces are easy to understand. 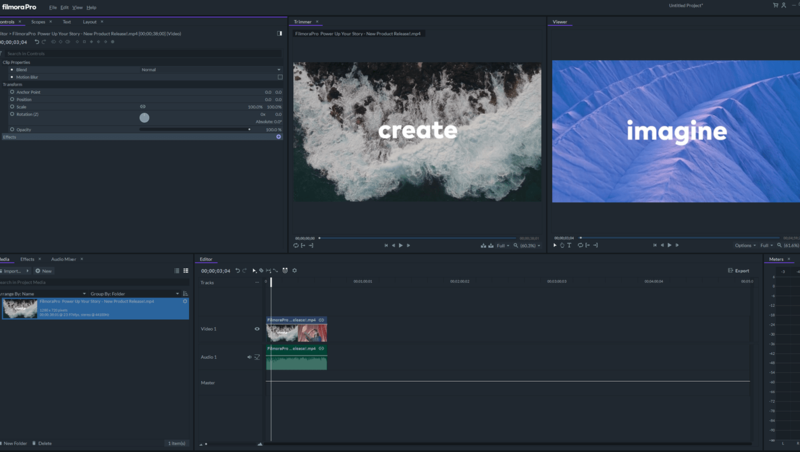 If you’ve worked with Adobe Premiere, you’ll definitely feel comfortable with Filmora’s layouts. Performance was exactly what I expected based on the hardware I was running it on. No slowdowns or issues were present, and I didn’t experience any crashes. Timeline playback felt a tiny bit slower than my experience with Da Vinci Resolve, but not significantly enough to cause problems. The software works well, offers a wide variety of features, and includes a number of nice bonuses. It’s a small thing but just including some LUTs at launch is a nice touch, as it makes it easy to quickly see results. Pricing is very competitive and offers a much-appreciated one-off lifetime purchase. A lifetime license is $149.90, while a one-year license is $90 at current sales prices. This compares quite well with Premiere at $240 for the single app plan for a one-year license. A free trial is available without any limitations other than a watermark on export. 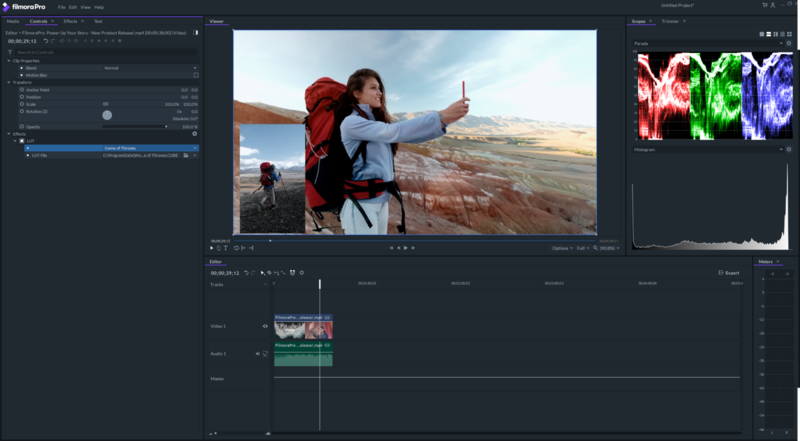 If you want to start taking your video editing seriously, FilmoraPro is worth considering, thanks to its variety of features and attractive price point. If you’re coming from another editor, take a look at their website and consider the features. Given the ease of download, installation, and trial, I definitely recommend giving it a try against your existing editor. "A lifetime license is $149.90, while a one-year license is $90 at current sales prices. This compares quite well with Premiere at $240 for the single app plan for a one-year license." Mind explaining your point of view on the issue? I'm sorry, English is not my mother tongue... I thought you were comparing either a one time $149.90 payment for a lifetime license to a recurring $240 payment that you have to make every year, and concluding that it "compares quite well", when in my opinion, it's widely different and does not compare at all. Maybe I misunderstood. I'll give this a good hard look. It's a mistake to buy a product stuffed full of features we never use. I just want something that does the basics and - esp with video - is reasonably fast. I suggest taking a good hard look at DaVinci Resolve. It might seem a bit intimidating up front, BUT, it is a professional level video NLE application, there are many 'how to' videos available on YouTube, and last but not least, it is compleley free for the personal level and no ads. As a paid alternative, perhaps Vegas Movie Studio will be a reasonably pricced paid alterantive. Somehow apps like Filmora Pro, Movavi,etc seemed to be heavy handed on trying to upsell this add on and that add on. And specifically with Filmora Pro, I tried to import some 4K video clips into the timeline and all I got was a bunch of jittery and flickering performance on the timeline. I shot the 4K footage on my Galaxy Note 9 with variable frame so that might have been the trouble. But Davinci Resolve deals with it without a problem. It works for me just fine, using latest Google Chrome, Vivaldi, etc. Then try the basic URL and do a search for the product. Or simply google search.